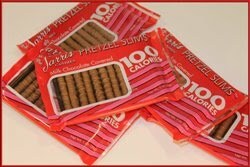 mommy's reviews: Enter to win Sarris Chocolate Pretzles! I entered this giveaway today over at Sammi's Blog Of Life. Winner will receive a six pack of chocolate covered pretzles! YUM!